Bona Sforza of Italy was chosen to be the wife of Sigismund I of Poland some 5 or 6 centuries ago, thus merging two of the world’s most amazing cuisines, in my humble opinion. My heritage may be Polish, but I think the gene for the love of good food is at least half-Italian. And so I share some of my favorite food from this holiday with you. Our “ski break” holiday ended a day early, not because we weren’t enjoying the warm and sunny weather, though. The forecast for the mountainous areas through which we would return had changed, with calls for snow accumulations. Now, while I may own a snowy weather capable vehicle from a Scandinavian country that knows snow, that does not mean I want to actually drive in said snowy weather. Plus, there was the pesky business of addressing our failed boiler in the Vienna house, a matter that could not be addressed if we returned on Saturday. And so, Parma and Modena will just have to wait for another time. For anyone cartographically inclined, the drive from Udine, Italy to Klagenfurt, Austria passes through the Alps and is generally miserable. Think winding roads, commercial trucks, Italian drivers and slow speeds, in good weather. Adding snow to that equation was not my idea of fahrvergnügen. So we routed ourselves through the Dolomites and via Innsbruck, a much wiser decision. The house was a chilly 11°C when we arrived. Tony gave the boiler a quick look-see and determined that repairing the leaky valve might just help matters. And indeed, by morning the temperature was a tropical 17°C. We still kept our required appointment with the “maintenance” person, who walked around our house for 90 minutes feeling the radiators and pronouncing, “alles gut.” Can’t wait to see the invoice. We awoke on Friday to snow! Beautiful, fluffy, snow! This is the view looking up into the pine tree that sways fiercely in our garden with the winds. The chestnut tree on the other side of the garden and a view toward our garden from the path. Running errands in the 22nd, I spied a gentleman feeding the local pigeons, and the snowplow tram. We don’t have these novelties in DC. With less than a month to go before Spring officially arrives, we thankfully haven’t tired of winter yet. Besides, we leave in five weeks for Croatia, so what’s a few more weeks of snow when we have more blue skies and warm temperatures to look forward to? Bologna, nicknamed “The Learned” and “The Fat.” The city definitely had a different feel than Florence and the hill towns. In the main piazza stands the Neptune sculpture, a curious emblem of the city given that Bologna is not a coastal town. The dolphin-riding lactating nereids from whose breasts water streams in the warmer months, commissioned by Bologna’s Cardinal Legate to celebrate the election of his uncle as Pope Pius IV, gave us pause for consideration, as well. Bologna, The Learned. The University of Bologna is the oldest university in Europe. Under the Napoleonic Era the university acquired space throughout the city for different topics of study; in the original structure is the anatomical theater for the medical school, considered the first seat of study in Europe. The palazzo housing the university was severely damaged in WWII, and the theater was rebuilt from pieces salvaged in the rubble. We were rather surprised that visitors could walk freely through the space, and even sit on the benches. And there was no entrance fee to do so! Apollo on the ceiling of the theater. The elaborate porticos of the university open to a courtyard, and through them we walked with hushed tones in the umber of three Popes (Innocent IX, Alexander IX, Gregory XV); Nicolas Copernicus (an assistant to Ferrara, an Italian astronomer), and the inventor Guglielmo Marconi. Bologna is also noteworthy for its covered porticos throughout the city. They are all different, and given that the weather was overcast with occasional sprinkles, we could move about nicely protected from the elements. Bologna, “The Fat,” I’ll save for a later discussion. The task of putting pen to paper over my love affair with food and eating can not be undertaken lightly. We read that the sun made an appearance in Vienna this week! People streamed out of their homes and into the streets, pointing their pale faces toward the golden orb in the sky, ever hopeful for a chance to squint at the sun. 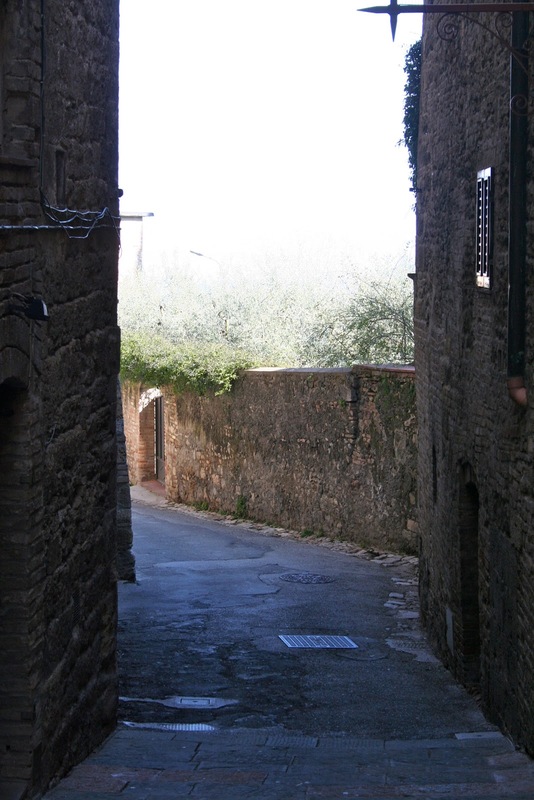 Though we are not home, we, too, were once more pointing our pale faces toward the sun from atop two of Tuscany’s favorite hill towns, Volterra and San Gimignano. The sun retreated behind the gray and snowy skies of Vienna again, perhaps not to be seen now until April. 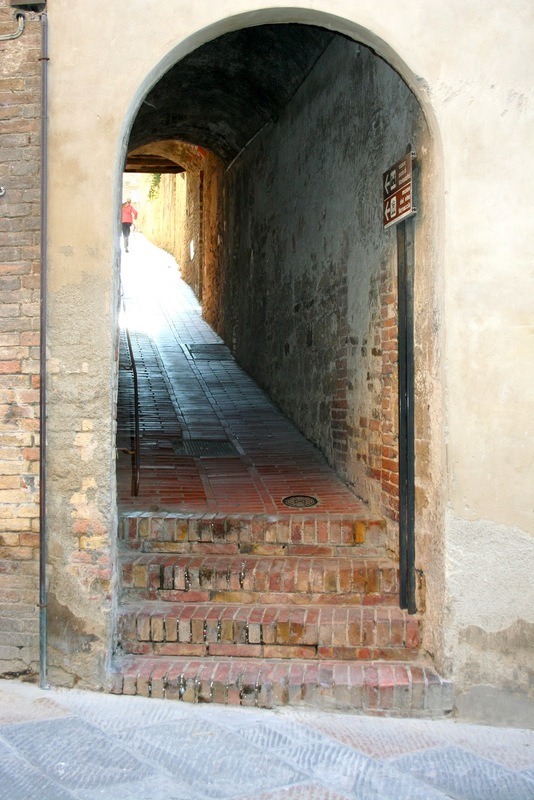 And so, especially for our Viennese friends, we graciously share several photos of another warm and sunny Italian day. You’re welcome. 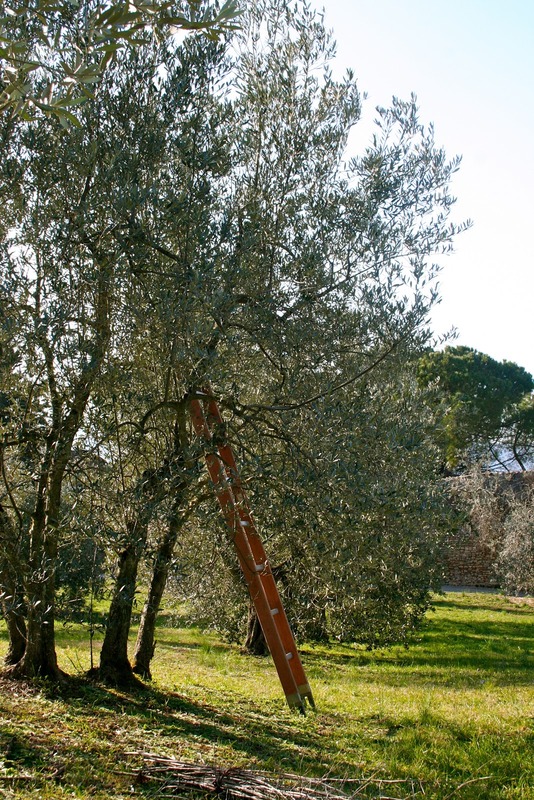 Although not perfectly picturesque due to the smoke from Tuscan farmers burning olive branches, the scenery still begs to be absorbed by the senses. 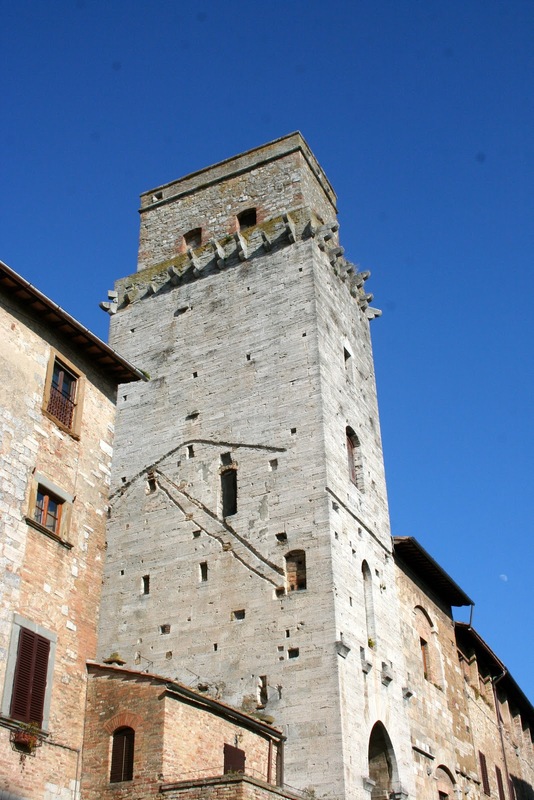 Volterra, the smaller of the two hill towns. 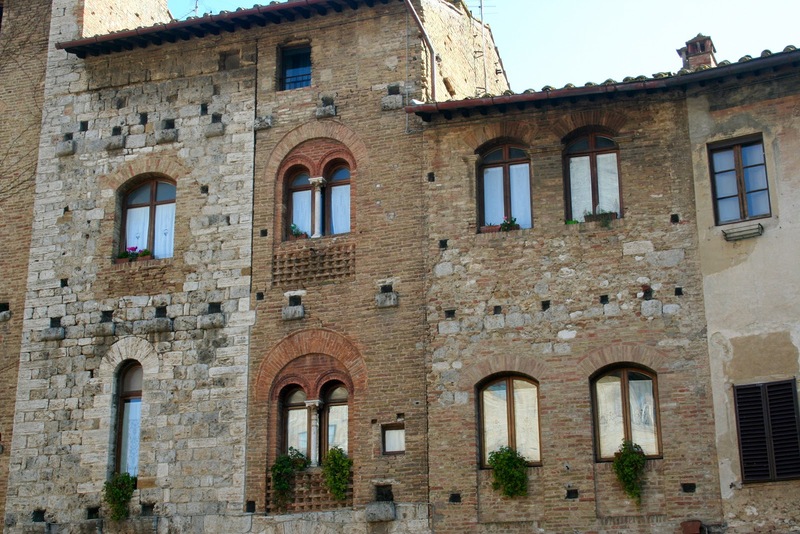 Less toured by visitors than San Gimignano, but no less charming. 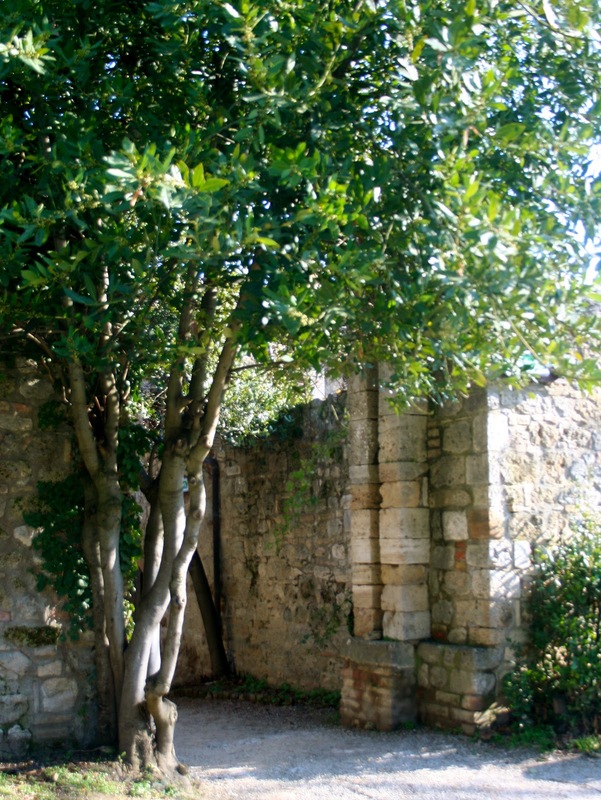 Just outside the city wall are some of the best preserved Roman ruins outside of Rome. On our last visit it was possible to view the ruins up close; a decade later, not so much. 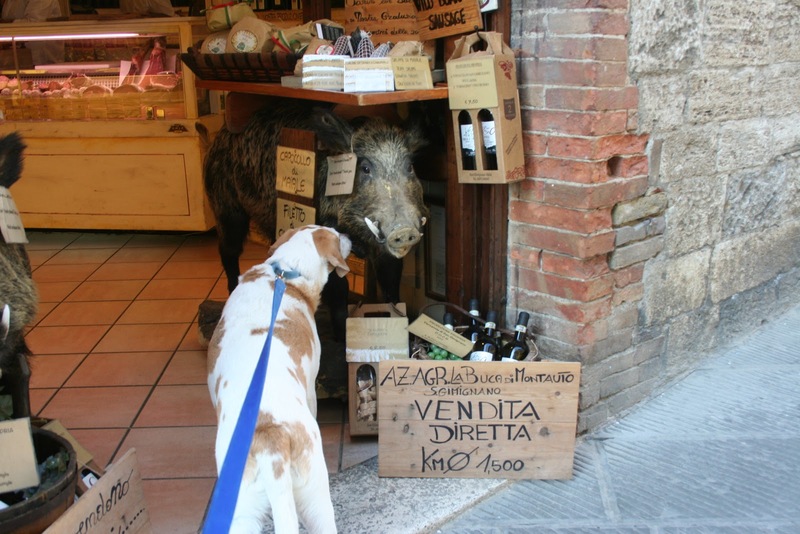 A couple of friends thought the children might be bored in Tuscany. Maybe some are, but not ours. The 3 B.C. 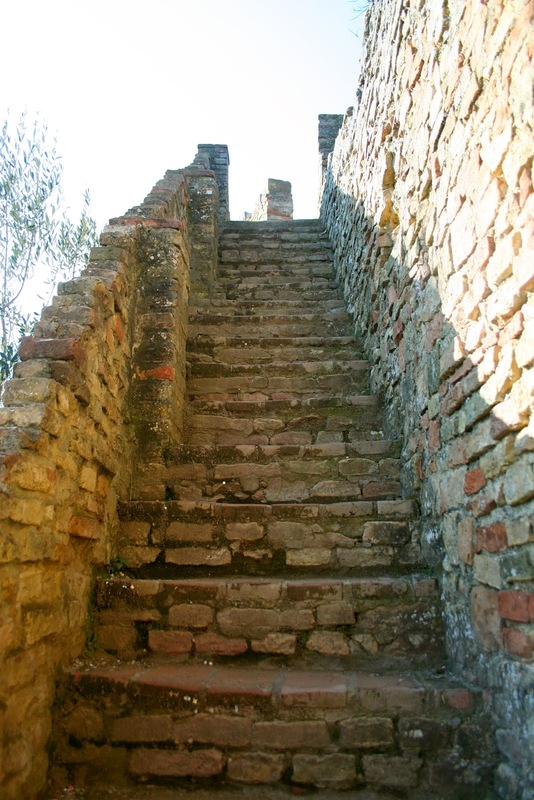 Etruscan City Gate, modified slightly by the Romans. Once upon a time the three stone blobs were the busts of Zeus and his two sons. 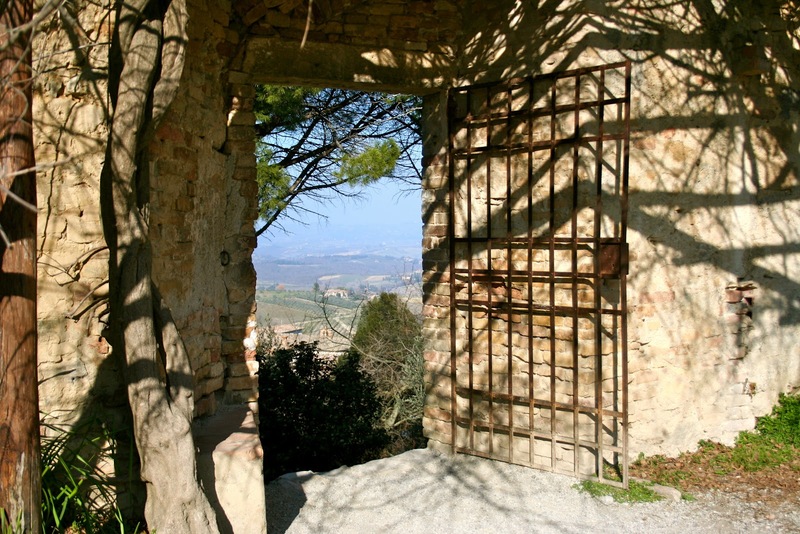 During WWII, the citizens of Volterra filled the gate with rocks and boulders to prevent an attack by the Germans. Their heroic efforts are commemorated on a nearby plaque. En route to San Gimignano, we offered a Grazie to the sheep who contributed to the delicious fresh pecorino sandwiches we snacked on from this roadside farmer’s truck. The vines are ordered much differently than in Austria. 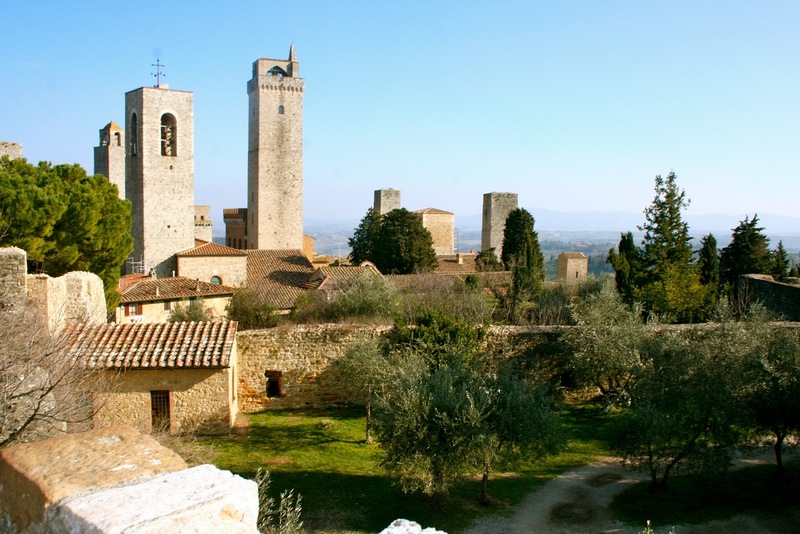 Several of the San Gimignano towers appear in the distance. 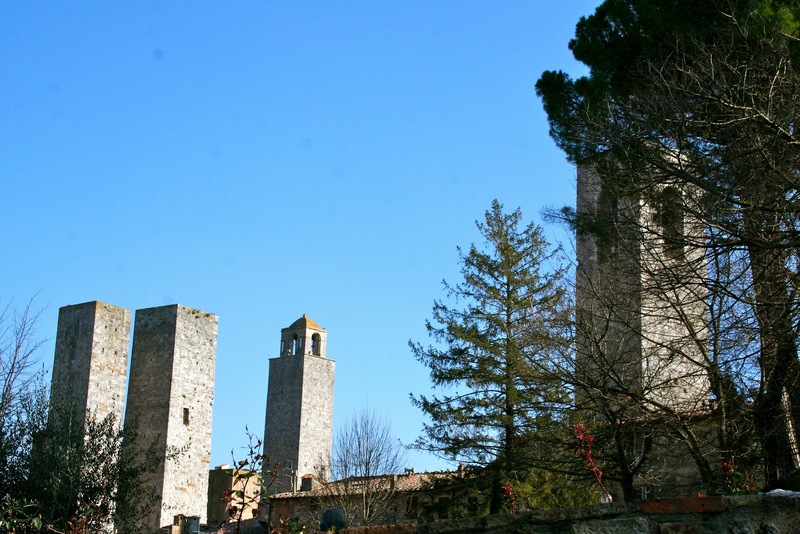 Only 14 of the 70 towers remain in this ancient Roman skyscraper city now. Tony and I visited San Gimignano on our last visit for all of 30 minutes, 20 of which were spent wading through the disgorged tourists and tour buses at the main city gate entrance; and 10 of which were spent deciding that we weren’t going to enjoy strolling a city filled with said tourists jamming every nook and cranny. We left, telling ourselves we would return another time. This is the visitor parking lot in the early afternoon on our visit this week. Not a tour bus in sight. I squealed. Poor Clayton Theodore. So tired from sightseeing that he practically fell asleep standing up. 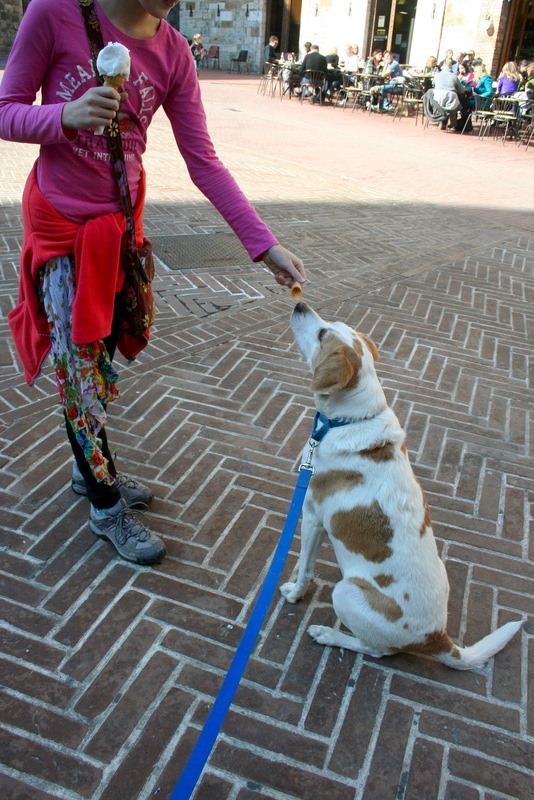 Someone needs a gelato snack to perk up. “Award Winning Chocolate” read the label in the gelateria. No disagreement from us. An afternoon of exploration awaited. 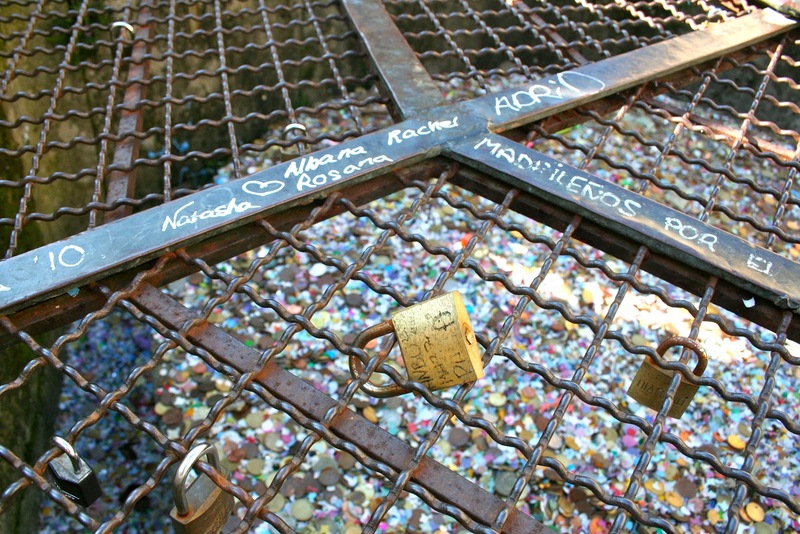 No bridges in the city on which to hang a love padlock, but the gate across the old city well makes a fine stand-in. 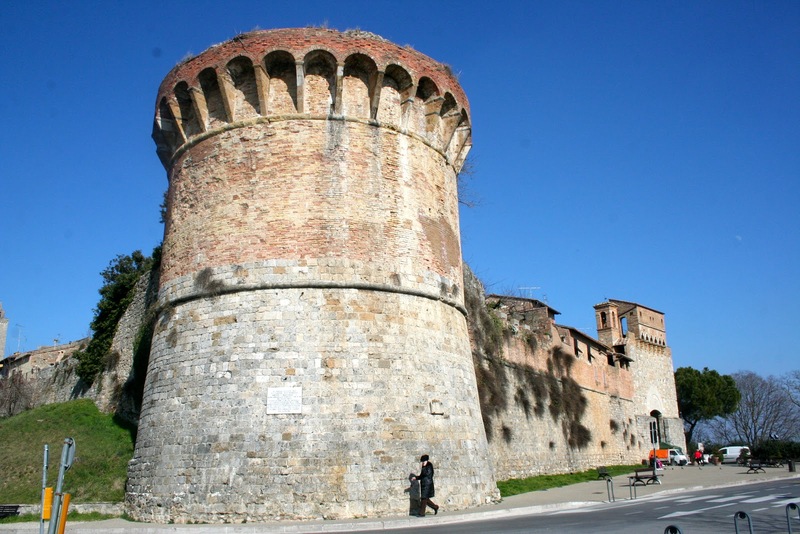 La Rocca, 14th century fortress remains atop the city. "It’s shorter than I thought it would be"
Another warm and blue-sky sunny day in Italy. None of us are really missing the bleak grays of February in Vienna. Not that we don’t love living in Europe. Simply put, though, gray is not a flattering color. 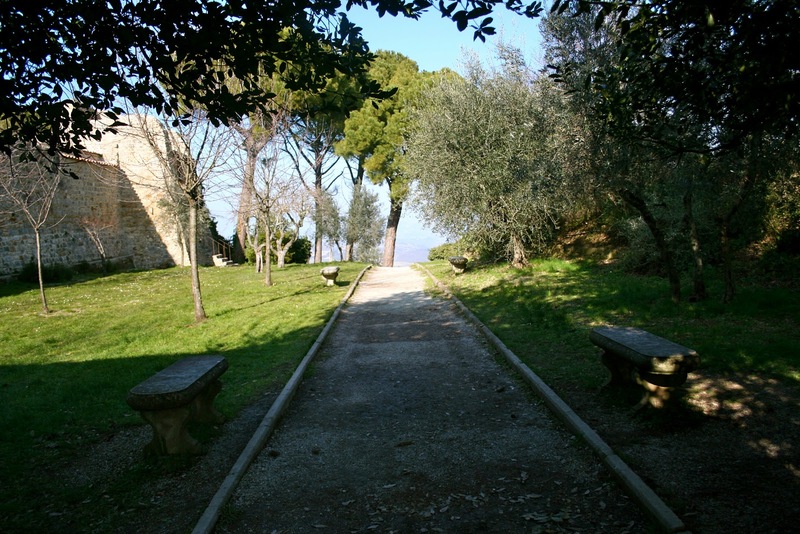 …all tucked inside ancient Roman city walls with impeccably groomed grass. But what is that? Leaning out from behind the Duomo? Torre Pendante against a blue sky. The postcards in the souvenir stands were not even this picturesque. So, so, many tourists posing for this photo that I really think the North African tchotchke hawkers should reconsider their business strategy. We paused for an al alfresco lunch at a sunny restaurant near the Torre before sallying forth on our day. Clayton Theodore loves pizza Pisa. Our detour to Lucca was via an Italian National Park, where we all dipped our fingers (and canine toes) into the Ligurian Sea. 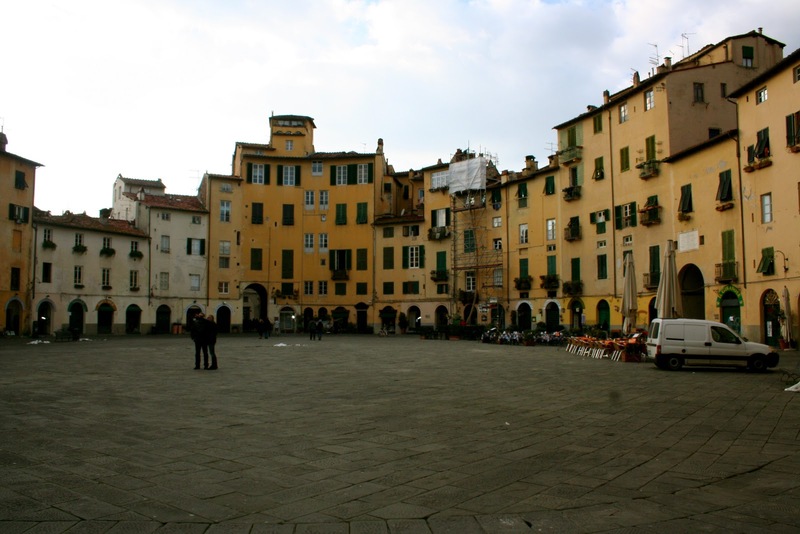 Lucca is a pleasant walled city. 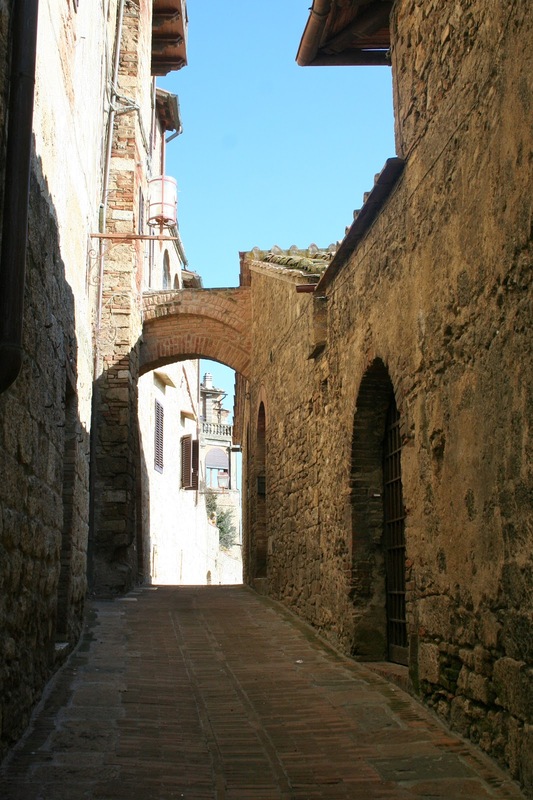 The children rented bicycles and rode the ramparts around the city while Tony and I strolled the ancient cobblestone streets with Clayton Theodore, savoring the warm sun on our faces in our private passaggieta. But first. Yes, the wood stove was indeed the only heat source for the villa (surprisingly, this feature was not mentioned in the “amenities” portion of the rental listing.) Fireplaces are charming in early fall or late spring, but I was duly concerned with its ability to keep me warm in mid-winter. 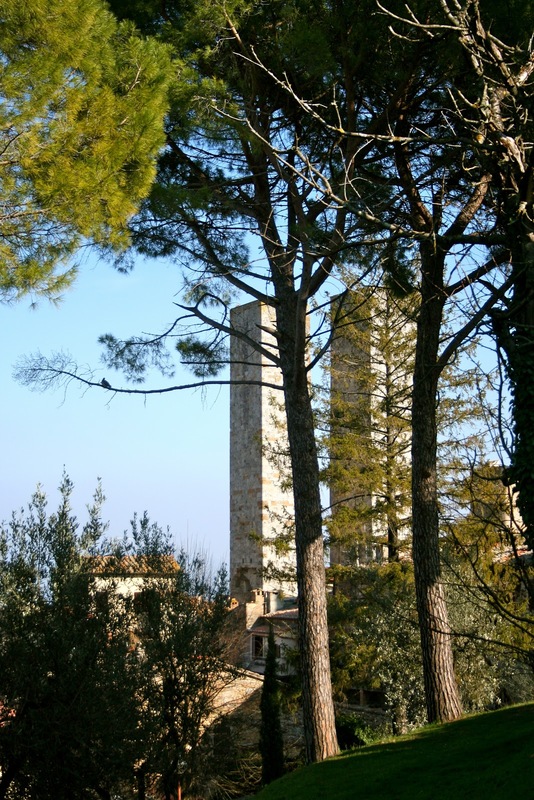 By morning the fire had faded, the villa was chilly and I was just a little grumpy about being on a Survivor: Tuscany in Winter holiday. 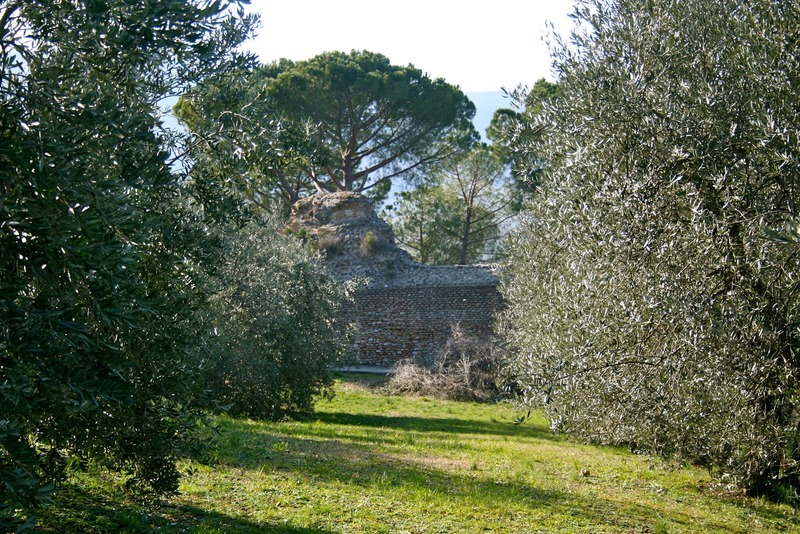 All of my First World Whines disappeared, though, when I turned Clayton Theodore into the garden and saw the Apennines in the morning light. The drive to Florence didn’t disappoint, either. 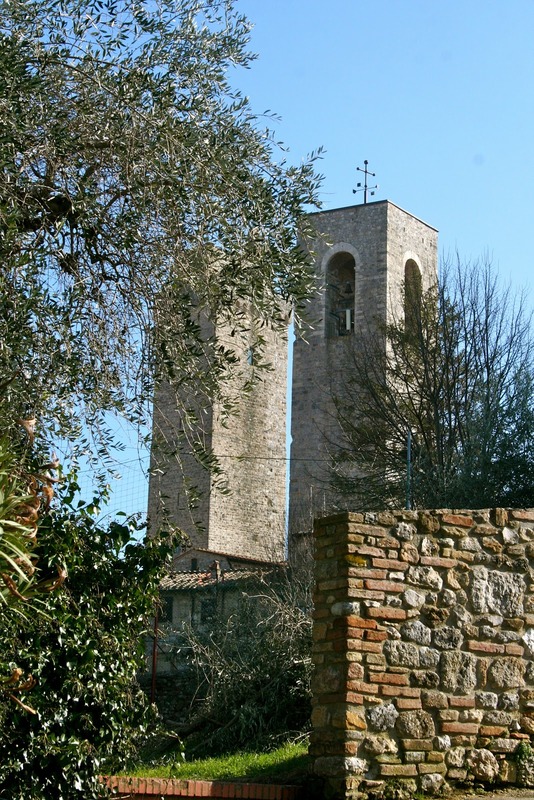 The children were impressed enough to remove their iDevice ear buds and comment on the beauty of Tuscany. Rather serendipitously we discovered a 400-part PBS series, “Medicis, Godfathers of the Renaissance” on Netflix, and for the last month caught bits and pieces of the series as an introduction to Florence, so we were excited to see the city in person. 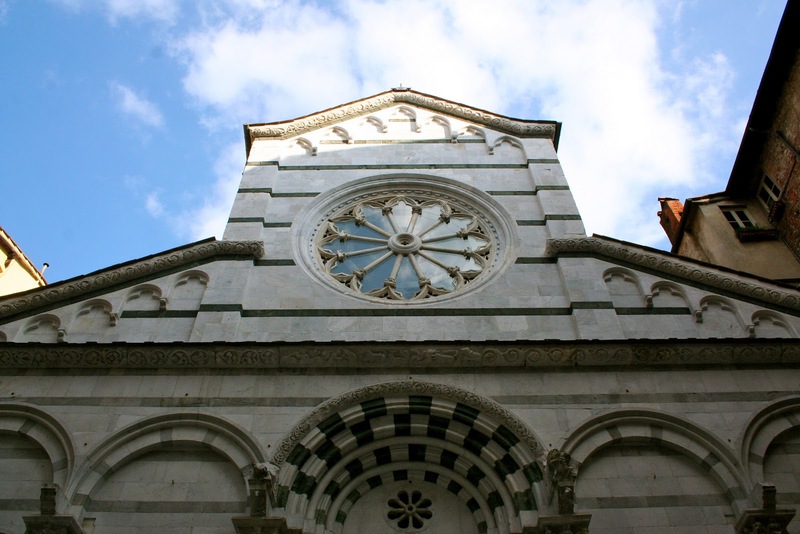 The Duomo makes for ease of navigation, and after successfully maneuvering the Zona Traffico Limitato (the famous “limited traffic zones,” entry through which results in hefty fines) to park the car, we followed the tourist trails to the cathedral. St. John’s Baptistry was closed for restoration, but most tourists only come for Ghiberti’s Bronze Doors. Firenze’s Duomo. 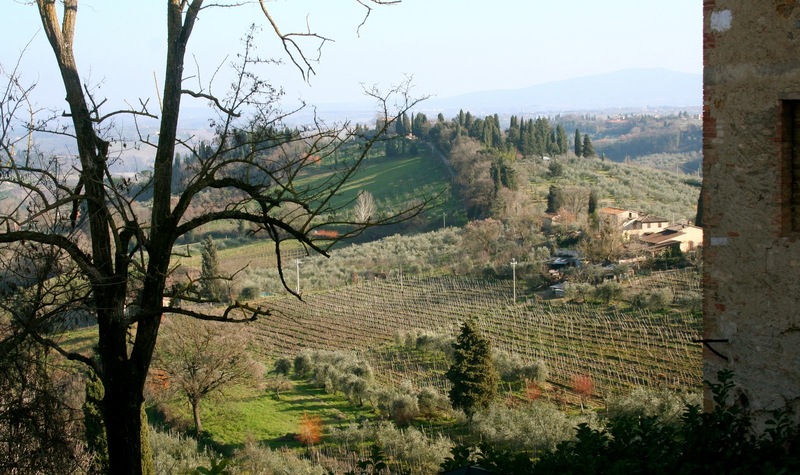 As stunningly beautiful as in 2004, when Tony and I blazed through Florence in six hours on our Tuscany holiday to give ourselves a brief change of scenery from walled cities and long lunches in sunny piazzas. We all climbed the 453 steps to the top of the Duomo and the spectacular vistas. The climb is not recommended for the meek, or those who are uncomfortable getting close to fellow travelers making their descent from the top. At the base of the Duomo there is the opportunity to pause and admire The Last Judgment frescoes. In the background, left, is Santa Maria Novella; the towered structure on the right is Palazzo Vecchio. Back down on earth we strolled over to Piazza del Repubblica for a dose of art appreciation and people watching. A sculpture portico. 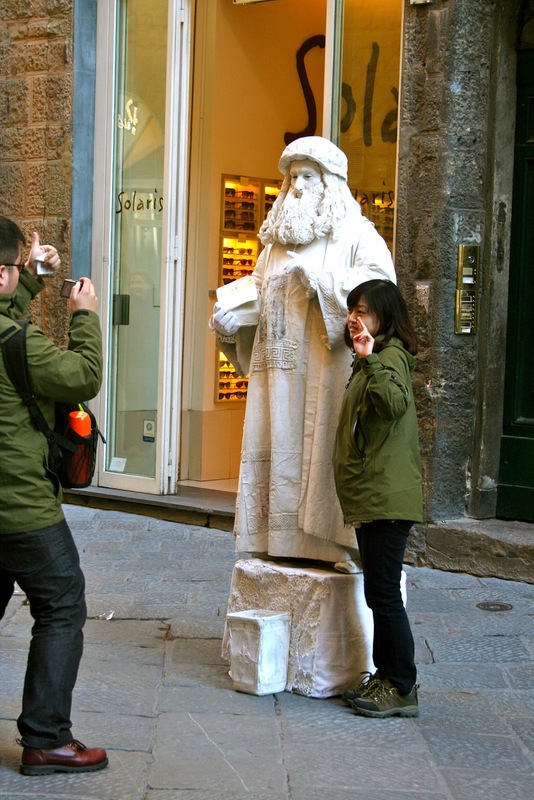 That’s how much art there is in Florence. The two days were a Renaissance feast for the senses. 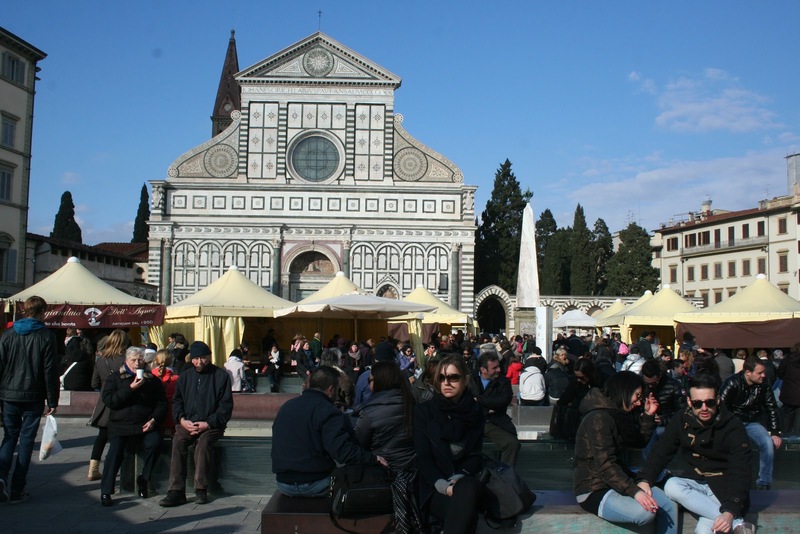 Especially on our second day, walking, very slowly and thoughtfully, through a chocolate festival in Piazza Santa Maria Novella on the way to the parking garage. But more on the food later. 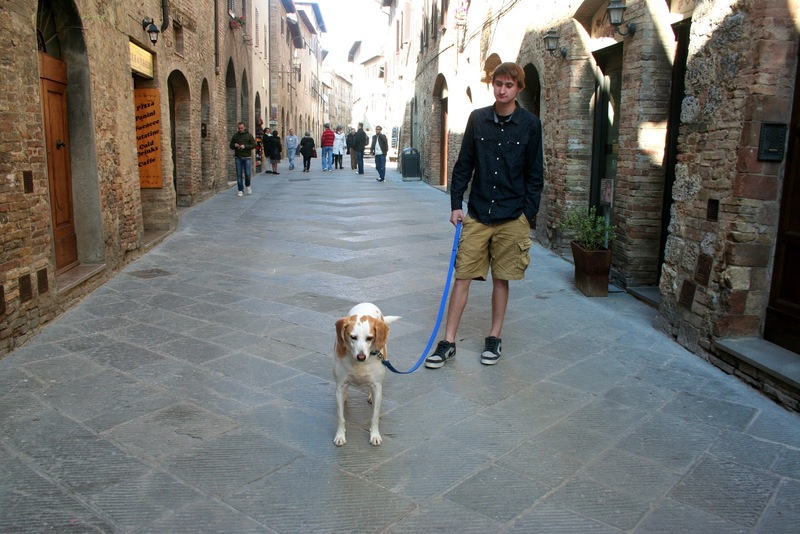 We spent two days in the city, returning each night to the villa. The children found bliss in the pleasant temperatures outside; Clayton Theodore paced the fence line of the garden in a staredown with the chickens and roosters in the next yard; Tony built a Boy Scout strong fire and opened the wine; and I played in the kitchen (with a gas cooktop! Oh, how I miss my gas cooktop! ), whipping up a fresh pasta for dinner. But more on the food later. Our goal was not to check off every “must-do.” It never is. One of the two fixed agenda items was a morning at Galleria Uffizi, the one and only art museum on this holiday. The Uffizi was so void of tourists that, sitting in the Giotto gallery, we could almost feel the birth of the Renaissance ourselves. Botticelli’s Allegory of Spring and Birth of Venus could be viewed up close, too. 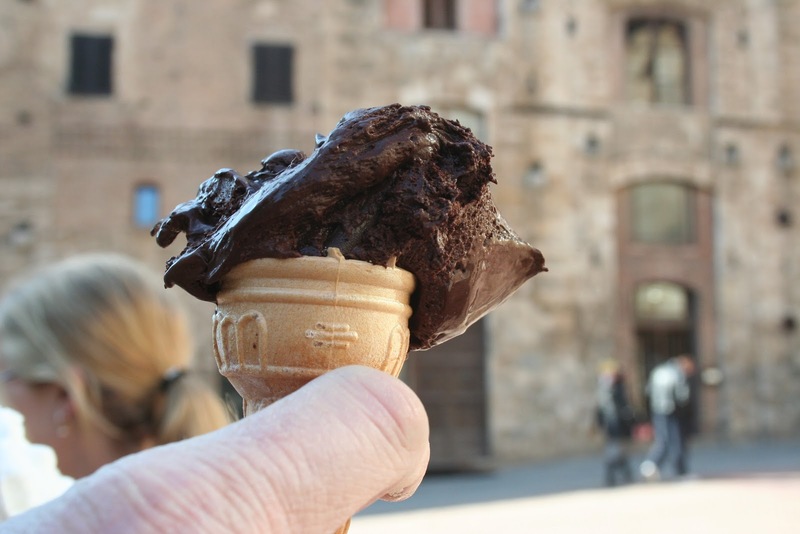 The rest of our visit to Florence was given to exploring as we saw fit, with periodic gelato pauses as the second, and most important, must-do. Every silver lining must come from a cloud, no? While we achieved heat in our Italian villa, it appears that we overlooked a scheduled maintenance on the boiler in our Viennese house and will likely be returning to a frosty home, unless I can reach the heating person this week to schedule an appointment for our return on Saturday. No chance of that at all. I’m not complaining, really, but we are reaching, or perhaps have reached, the point with the owner of our house where the idea of moving warrants merit. But more on that later, too. "Is this the only heat for the house?" And so our holiday in Italy began. The drive through Austria was gray and frosty. But almost as if by magic, once we cleared Klagenfurt, Austria and crossed into Italy, the clouds disappeared to reveal the stunning peaks of the Alps against sunshine and blue skies, and the thermometer in the car climbed to 11°C. No travel mishaps en route save for 1) thinking we had driven through Slovenia based on a sign we’d read and the subsequent panic over not having one of their grossly expensive highway vignettes (we hadn’t); and 2) the strange occurrence of the rear passenger car door refusing to open after a rest area pause, causing poor Anna Grace to have to climb into her seat from the driver’s side. In good time (and daylight) we reached our rental villa. The owner of the house was most pleasant and gracious, providing not only a bottle of wine but a jar of homemade pasta sauce for us to enjoy, and a blanket, bowl of fresh water, and a snack for Clayton Theodore. A most appreciated welcome after a long drive.